Britain's Transport Secretary Doors Cyclist, As Seen In Video : The Two-Way Days after he said bike lanes can cause "too much of a problem" for London drivers, a video emerges showing Transport Secretary Chris Grayling's car door striking a passing cyclist near Parliament. Days after he said bike lanes can cause "too much of a problem" for drivers in London, a video has emerged that shows Britain's Secretary of State for Transport Chris Grayling opening his car door and striking a cyclist near Parliament. The incident took place in October and was captured by the video camera of a cyclist who was trailing Jaiqi Liu, the rider Grayling struck with his SUV's rear door. The second cyclist, Laurence de Hoest, says he sent the video to The Guardian after Grayling spoke about the problems bike lanes can cause drivers. After his door struck Liu, Grayling moved quickly to check on the man; the two are seen speaking and they eventually shake hands. From all indications, neither Liu nor de Hoest knew Grayling's name or his role in government. De Hoest tells the BBC that he only later connected Grayling to the incident — and that he decided to share the video after the secretary's criticisms of bike lanes were highlighted by Cycling Weekly last week. The video is shot from a fair distance behind the accident, making some details hard to decipher. But it seems to show Grayling's door popping open at the exact instant Liu attempts to pass his vehicle. The cyclist is sent sprawling onto the sidewalk; his bike clatters against a lightpost, its blinking front light was knocked onto the asphalt. Liu is then seen sitting on the curb, gathering himself. A spokesperson for Grayling tells The Guardian, "This was an unfortunate accident," in which Grayling made sure the cyclist was OK and apologized before leaving. British Transport Secretary Chris Grayling, seen here after a Cabinet meeting at 10 Downing Street, is seen opening his car door on a passing cyclist in a video that was captured by a bike rider in London. Liu was doing what's known in Britain as "filtering" — riding past slow or stationary vehicles. He says that after Grayling's door knocked him over, the man stayed for around two minutes but left without providing his name or contact information. "One thing he did say was that I was cycling too fast, which was not true," Liu tells The Guardian. "That made me really upset. He made out it was my fault." It was his first and only accident, Liu says. He filed a police report about the incident, in part to help the authorities track road safety. News of the incident has generated much discussion — including, on the Cycling Weekly site, a debate over whether Liu might have been somehow at fault or whether it's safer for cyclists to simply ride in the center of the road on routes where a bike lane is temporarily merged with motorized traffic. Cycling UK, a national charity that has recently partnered with government agencies to advocate safer roads, is now offering to help Liu with any legal costs — including a potential private case against Grayling. "Mr. Grayling as a former Justice, and the current Transport, Secretary should know it's a criminal offence to open any door of a vehicle on a road so as to injure or endanger anyone. Currently, it's treated as a minor offence with a maximum £1,000 (around $1,250) fine, despite the fact that people have been killed and seriously injured by car dooring." Dollimore added, "There are questions about why Mr. Grayling was not prosecuted for what appears to be an offence" — citing Britain's Regulation 105 of the Road Vehicles (Construction and Use) Regulations 1986 and Section 42 Road Traffic Act 1988. In last week's interview that originally ran in the Evening Standard, Grayling, who was appointed to his current post in July, said he hadn't ridden a bike since his days at Cambridge University. And he warned both drivers and cyclists to be more careful. "Motorists in London have got to be immensely careful of cyclists," he said. "At the same time, cyclists in London are too often unwilling to obey the road signs. I've seen regular examples of people who just bolt through red lights. "The growth of cycling is a good thing. But good cycling is responsible cycling." 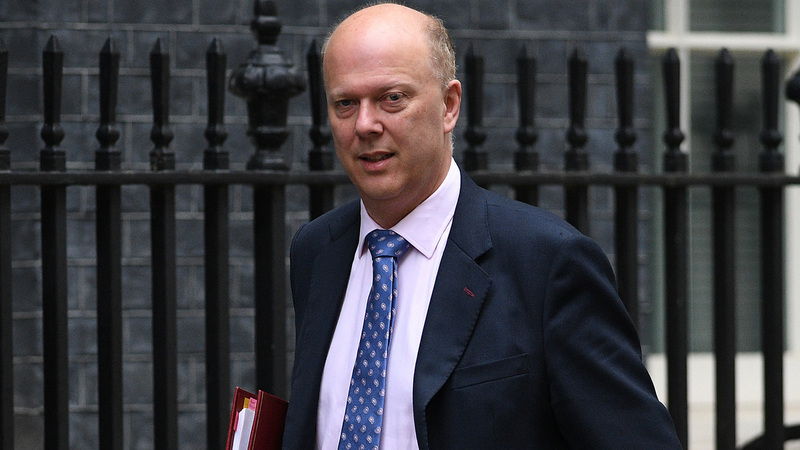 Grayling might have avoided the incident — and the attention that's followed — if he had followed the rules his Transport agency laid out for drivers last month. At No. 6 on its list of "simple tips" for drivers to improve the safety of cycling was this entry: "Always check for cyclists before opening your car door." One tool Grayling might have used to do that is the "Dutch reach" — the habit of opening a door with your opposite hand, in a motion that orients the eyes toward the rear of a vehicle, making it easier to spot cyclists. As Outside Magazine reported in a recent story about the practice, some 10 percent of the roughly 45,000 injuries to U.S. cyclists in 2015 resulted from riders being doored.